Yes, many cats drink water. But does your cat drink enough water? Even cats eating a wet-food only diet can need up to double the amount of water they consume in their food for ideal hydration! 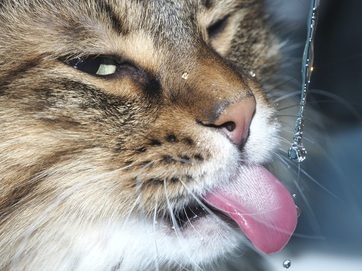 Cats need 8 to 27 *tablespoons* of water (or more) a day for an ideal rate of hydration (depending on environment, health status, and activity level). A typical serving of kibble for an average adult cat provides one-half tablespoon of water. Canned or homemade with a moisture content of 77% provides 6 to 9 tablespoons of water (based on average consumption by most cats).